Build your own computer. Make lights flash discover how your computer works. With simple steps learn to code art games music and more. Donƒ? ?t just play Minecraft hack it to do something new. Perfect for beginners expansive for experts. Endless play with a creative community. Everything you need in one box. 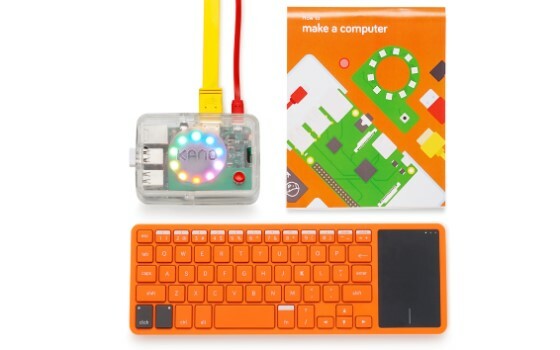 Step-by-step book Raspberry Pi 3 programmable LED lights DIY case power button wireless keyboard with trackpad memory HDMI and power cables stickers Kano's unique operating system 100+ coding challenges and 100+ apps learn to code with 100+ creative challenges and stories. Make art music apps games and more. Don't just play Minecraft hack it. Browse the internet use YouTube Whatsapp Google Docs and more. Endless play with Kano World ƒ?? our free creative community. Make share and play with people in 86 countries. Trusted by over 2000 schools and code clubs. Winners of the family choice award webby award red dot award cannes gold lions and more For ages 6+. No technical knowledge required. Includes Lifetime Care and 1 year warranty What's in the kit? Power Supply - Brings your computer to life Case Base - Protects your computer Case Lid - Every case needs a lid LED light ring - For making light shows Raspberry Pi 3 - Your computerƒ? ?s brain SD Card - To save your games and apps HDMI Cable - To connect to an HD screen Keyboard - To work magic without cables Sticker - Make it yours Storybook - Simple steps show you how Learn to code with guided step-by-step challenges get the confidence you need to build your own games music and more.